Blinken OSA has a collection of English language letters written by children from Sarajevo in 1993, to their peers (“Dear unknown friend”) in the United States as part of the Pen Pals for Peace Program initiated by George Soros. By the end of August 1993, some 400 letters from the besieged city, many with photographs, elaborated drawings and ornamented envelopes made their way across the Atlantic. In May 1994, the Open Society Fund published a selection of these letters in a tiny volume. Unfortunately, we don’t have any information about the further fate of the children. There are also a few letters sent by American schoolchildren, inspired by their Sarajevan mates, to President Clinton, urging him to stop the war. In the past few weeks we have processed and digitized the letters. 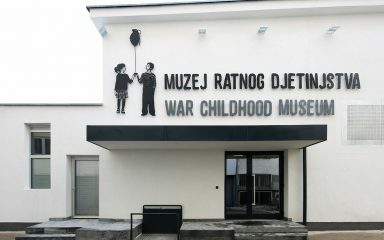 We keep the digital copies and two of our colleagues, Csaba Szilágyi (Head of Human Rights Program) and József Bóné (Head of IT) took the originals to the War Childhood Museum in Sarajevo, thus repatriating them to the war affected community where in our opinion they really belong. The letters will be added to the museum’s collection, and later, when all authors are tracked and have consented, they will be exhibited.